How to Make Peanut Butter at Home (So Easy)! Homemade Peanut Butter needs just minutes to make and a few ingredients. Once you make this easy recipe at home, you’ll wonder why you haven’t been making it yourself all along! 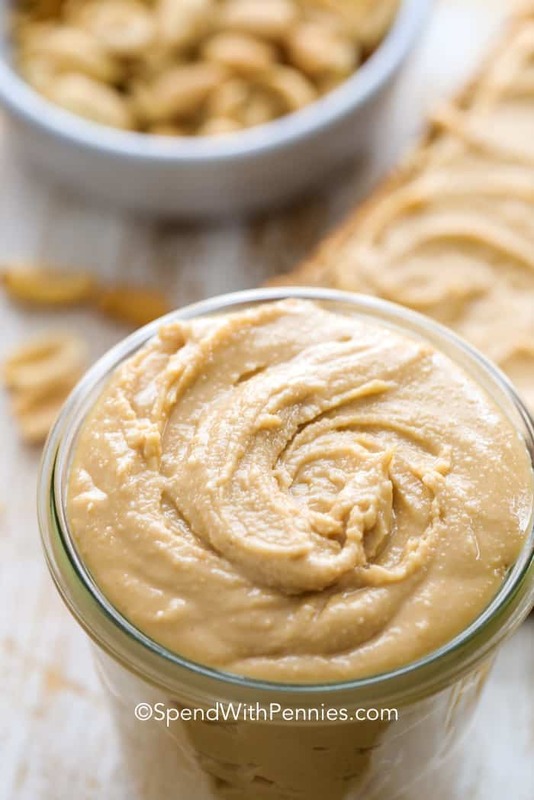 This creamy peanut butter is perfect for your fave PB&J sandwiches (on toast of course) or used to make a delish Peanut Butter Pie! Nothing says ‘all-American’ like a batch of homemade peanut butter! This natural peanut butter recipe is so easy to make, you’ll wonder why you ever bought it in a store to begin with! This is a great ‘first recipe’ to try with the kiddos, one of those recipes that gets them thinking about where their food comes from! Peanut butter is one of the ultimate comfort foods! 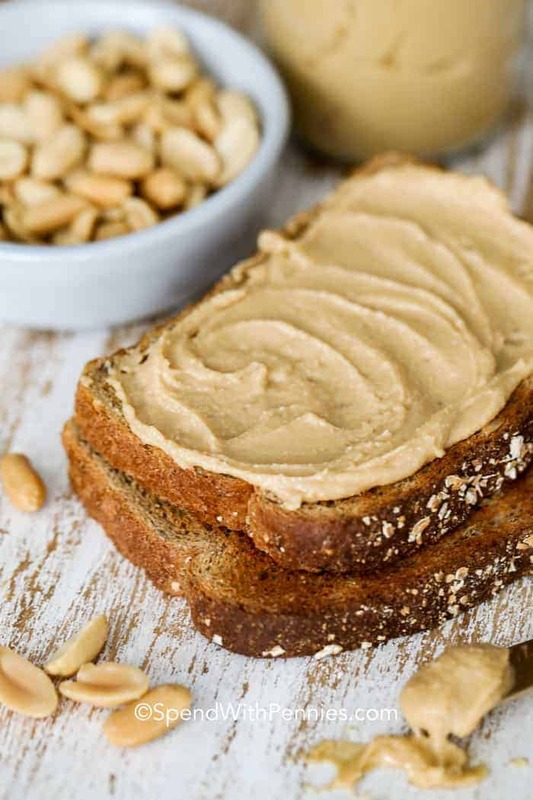 The good thing about this peanut butter recipe is that you can adjust how much salt you want, add a little extra honey if you’d like it sweeter. It’s even a great base for peanut butter cookies and peanut butter cheesecake! Seriously, who was this genius person? The man behind the legend was a Canadian named Marcellus Gilmore Edson who created ‘peanut paste’ in 1884. This was the process of milling roasted peanuts between two heated surfaces. In 1895, John Harvey Kellogg (yes, the cereal Kellogg!) patented the process in the United States, and the nutritious staple that is in 94% of American households today was born! What would childhood be like without the famous peanut butter and jelly sandwich packed into our lunches every day? Here’s the fun part! All you really need are peanuts, some honey for sweetness, and salt! I add a touch of oil to help with consistency. 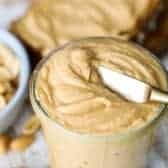 Homemade Peanut Butter is super inexpensive to make if your local supermarket has a bulk section! You will need a food processor to make this recipe. Buy shelled and roasted peanuts. Process the peanuts, honey, and salt in a food processor. Be sure to stop every couple of minutes and scrape down the sides of the food processor to get a smooth consistency. Adjust the honey and salt to your own preference.Slowly drizzle in the oil as you continue to pulse the food processor. Keep adding oil until you get the right consistency. 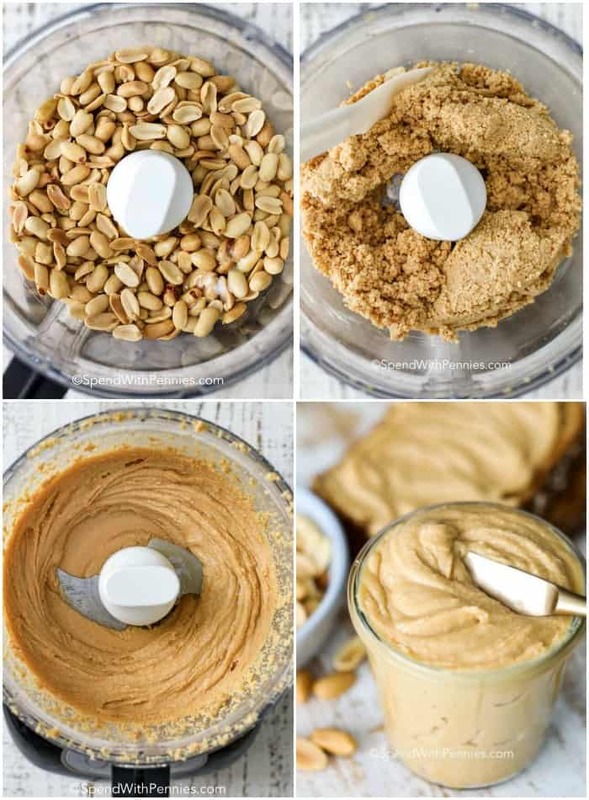 To Make a Chunky Peanut Butter: Process the peanuts in a food processor as directed in the recipe. Add 3 tablespoons (or to taste) chopped peanuts to the peanut butter! Then, just transfer to an airtight container and keep refrigerated until you are ready to use! The best way to store homemade peanut butter is in an airtight container and in the refrigerator just like you would a natural store bought peanut butter. Remember this delish PB has no additives or preservatives so it can spoil. You can always soften it up a bit by putting it in the microwave for about 30 seconds so that it spreads easier. Homemade Peanut Butter is easy to make with just a handful of ingredients! Process peanuts, salt and honey in the food processor for 60 seconds. Continue to process for about 1 ½ to 2 ½ minutes while slowly drizzling in the oil. Begin with 2 teaspoons oil and add more until you reach your desired consistency. Store your homemade peanut butter in an airtight container in the refrigerator. It will keep for up to 2 months.